With the backdrop of Chamundi Hills, in the lap of nature lives Beehive - Backpackers Commune. Fondly called as The Yellow House is a colonial-style bungalow replete with big french windows and a joyous lawn. 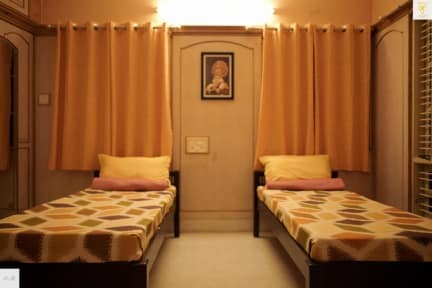 Be spoilt by choices as we offer 3 private rooms, 3 spacious dorms, fully equipped open kitchen, a small library and not to forget our lively common areas. Ideal for wanderers looking for long-term stay or travelers looking for local vibe. The crescendo to the story is our 1-acre spread lawn perfect to enjoy a chai tea, write a book or to spread your yoga mat and meditate in peace. Famous activities in this area are cycling, trekking and sightseeing. We also offer permaculture work exchange, local culinary experiences with a tour of the local market and yoga associations to deliver an authentic Mysuru stay. * large common space to lounge & meet other travelers. * hassle free & most flexible check-in check-out times. 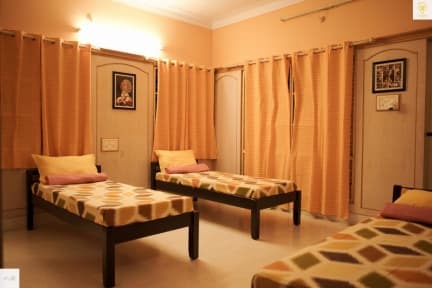 At BeeHive, we place our faith in the concept of ‘community living’. We are a supporter of sustainable and responsible traveling. We are a gender-neutral commune, perfect for solo or group travelers for budget and long-term stay. 2. Check in from 11:00 to 20:00. 4. Payment upon arrival by cash or online (Google Pay/Paytm). 7. Taxes not included.1000-2499 INR, 12% tax; 2500-7499 INR, 18% tax; over 7500 INR, 28% tax.